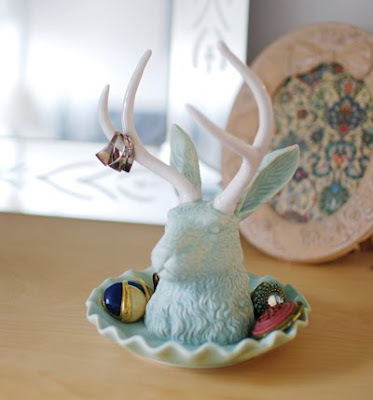 If you'd like a way to display a small jewelry collection or a few special pieces from a larger collection — or maybe just a neat place to put the jewelry you take off, before it goes back to its normal storage space — take a look at the cool things I've found. The jewelry stand above, from Evolving Habitat, is made from naturally shed deer antler. 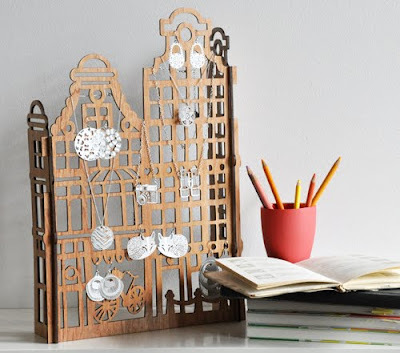 This jewelry stand, from Polli in Australia, is designed to resemble buildings in Amsterdam; it's made from salvaged timber. 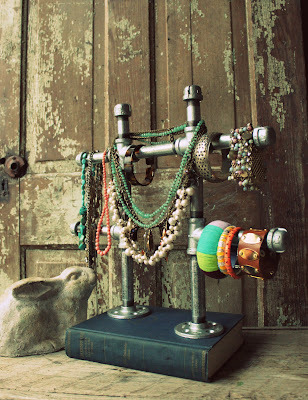 For a totally different look, there's the jewelry stand made from galvanized pipe, from Catie of fivetenfifteen. Decluttering isn't about minimalism; a decluttered home could be minimalist, but it certainly doesn't have to be. Rather, a decluttered home is filled with things that serve those who live there: things that are useful, and things that just delight the owners. I've read a couple blog posts lately that touch on this theme. First, Small Notebook pointed me to an article subtitled Lessons learned from a thrift store rug. Here's an excerpt — but please go read the full thing, and see the before and after photos. And yet... I care about the things that surround us. They matter. Minimalism isn’t so much about having few things (although it is about having few things) as it is about having the right few things. The things you need. We recently got something we didn’t exactly need. But then Cane ... said he'd seen this rug at the Salvation Army. A nice, big braided wool rug. The kind he really really likes. 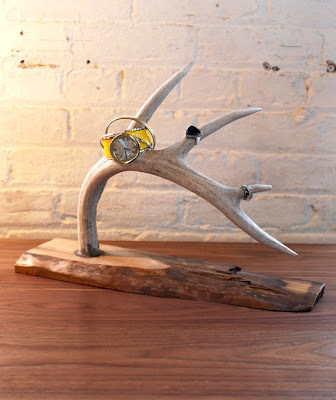 Do NOT buy something because it looks "nice." You have to set a higher bar. 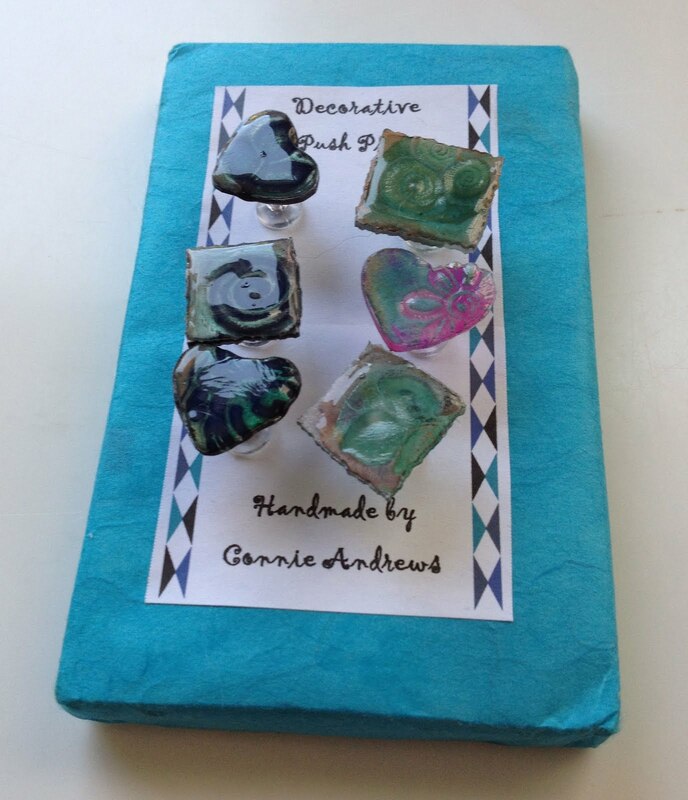 Find something that would make you disconsolate if you were to not bring it home with you. You will LIVE with this work; it's like a marriage. And finally, here's something from a shop, rather than a blog post. 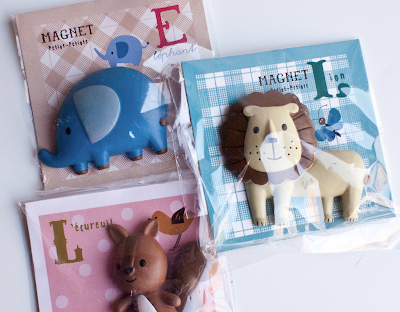 Omoi Zakka Shop stocks thoughtful items for everyday life. Taking cues from our experiences in Japan, we are drawn to quality goods that refresh and delight, be it by texture, design, or function. We feel that the best objects are the ones that make you happy to use them. So now you're doing your backups — but are you testing them to be sure they are working? No matter how sophisticated or comprehensive your backup system is, you will never know if it works unless you actually test it. Without testing, you can have no confidence at all. It goes on to list all the many things that can cause backups to not work as you expected. This is where the trouble started, because the backups were stored on a tape drive and as the files hit 4 gigabytes in size, the maximum size of the file was met. ... This meant that new data was being written to the drive, but it was ‘pushing’ the older files off. 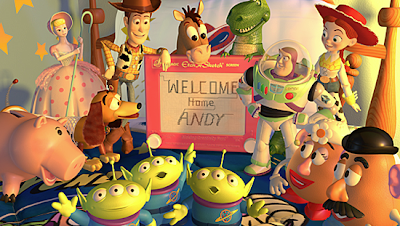 But no-one at Pixar knew this yet. I know individuals who've had problems with their backups, too. One person set up online backups with Carbonite — only to find, when she needed to restore files, that the backups had stopped working a couple months prior. Another person was able to restore her files, but found out they all had the same "create" date — the current date — instead of the original date. It's easy to think of these automated backups as a "set it up and forget it" scenario — but things can go wrong with any backup plan. I will make regular backups of my own data. I will test my backups to make sure they are actually useful. Credits: Thanks to Kevin Henney, who builds websites, for pointing me to that Toy Story account. The person who sent me this message also said, in another Twitter message: I worry about computer dying & don't think about theft. But people have computers stolen — or leave them behind in taxis and airplanes — all too frequently. On a trip with his daughter visiting college campuses, Neil had fallen asleep mid-flight and forgot to remove his MacBook Air from his seatback’s pocket. By the time he had returned home and realized his Mac was missing, the airline’s lost-and-found office had closed. When he called back in the morning, the Mac was still missing. In full-on panic mode, Neil contacted the Code 42 Support team. He had been working on a few confidential pieces that he hadn’t emailed to anyone. In Neil’s mind, they were potentially not backed up. CrashPlan to the rescue! Not only did CrashPlan have backups of everything he did up until he got on the plane, CrashPlan also retrieved his data in time for an important upcoming presentation. My absence from the Internet was a bit longer than I had anticipated today, for one genuinely depressing reason: I left my travel bag in the taxi that took me to my hotel from the airport, and that bag included my computer and some other stuff (including my car key). Almost everything I had on the computer was also redundantly stored elsewhere, so I have lost no work. I'm writing to you on behalf of the Concordia Community Solidarity Co-op Bookstore, an independent, not-for-profit cooperative bookstore located in Montreal. We would really really appreciate our computer back. Even if its just to borrow it to copy the files on it. See, our ENTIRE inventory and records are on that computer. Which means HOURS and HOURS of lost work, and HOURS and HOURS of work we will have to re-do. We will have to close the store to get this work done, at a time when we can't afford to close the store. So if you're not yet backing up your computer, please do something about that, right away. And that backup that the bookstore thought it had, but didn't? That will be the subject of my next blog post. Credits: Photo by charamelody, found on Flickr, licensed through Creative Commons. 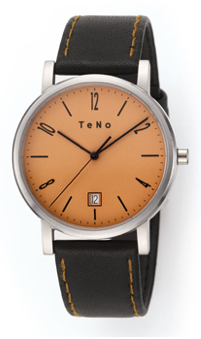 Another company with some neat watches is TeNo. 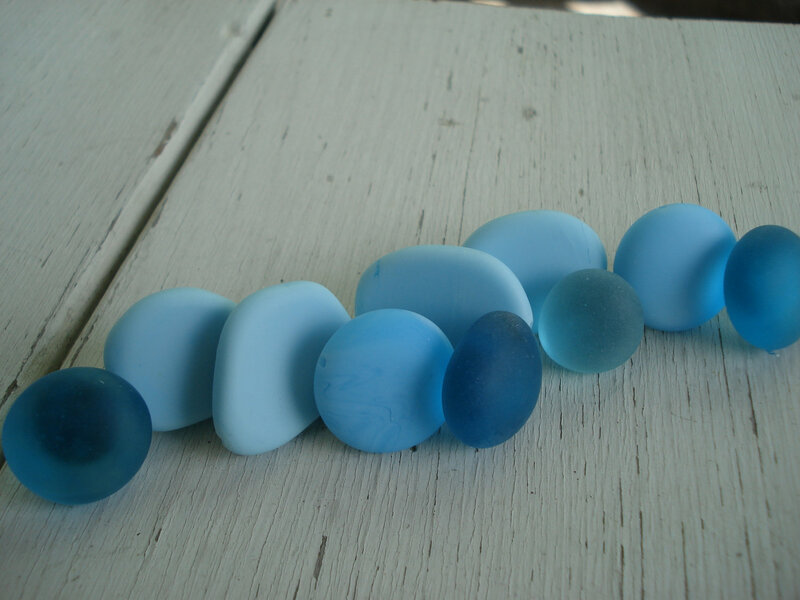 This one is from the TeNo 10 collection; there are a number of colors to choose from. One place to buy them is Unica Home. 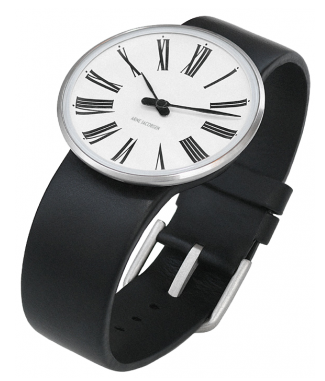 I'm also pretty impressed with the Arne Jacobsen watches from Rosendahl; there are two styles. 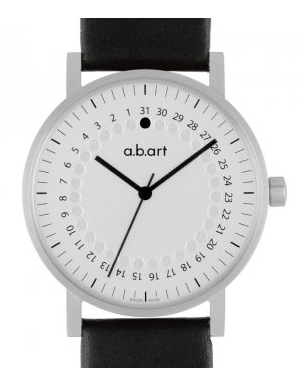 You can find them both — the Roman watch and the City Hall watch — at Skandium. Five years ago, my mother died from pancreatic cancer. In honor of her, I'm once again displaying some organizing products that come in blue, my mom's favorite color. 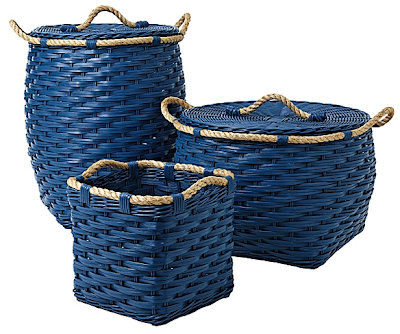 Let's start with these rattan storage bins sold by Serena & Lily. 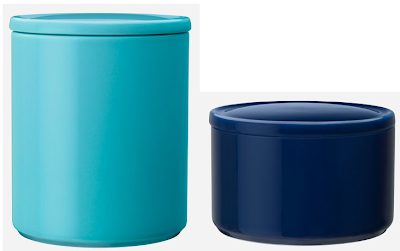 Iittala makes its ceramic Purnukka storage jars in two sizes and six colors, two of which are shades of blue. One place to buy them is Twentytwentyone. 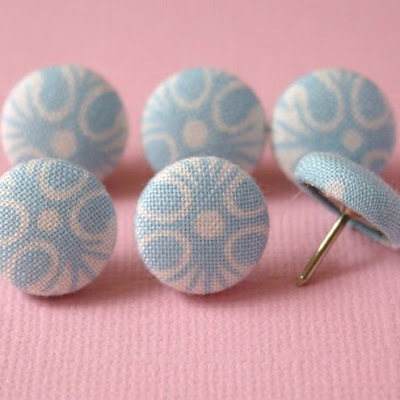 [via Retro To Go] Update on May 9, 2013: These no longer come in blue. 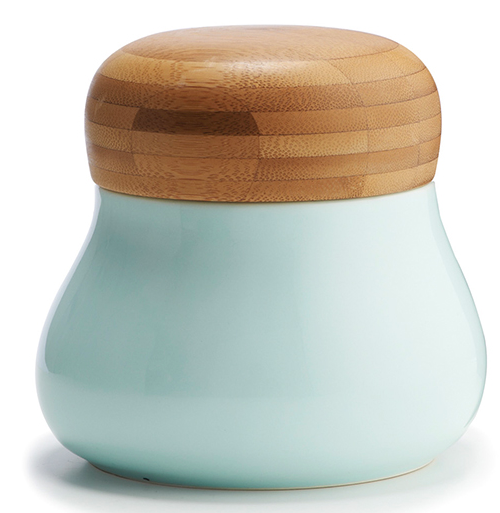 Kahler makes the Mano storage jar; it comes in various sizes and colors, including this turquoise one. You can get it from Illums Bolighus or from Horne. 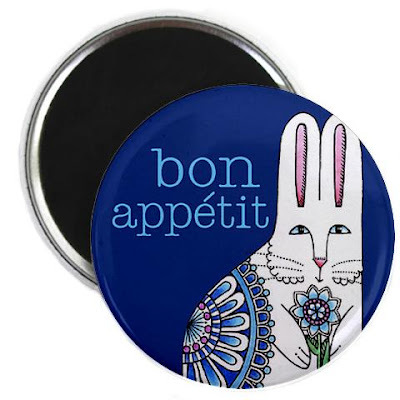 I've mentioned Susan Faye's work before, but not these magnets with their brilliant blue. 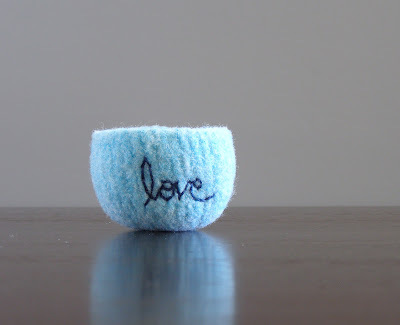 And I have to end with this little felted wool bowl from The Felterie. Note: Besides my mom, I've lost the following people to pancreatic cancer: a dear client, a client's mother, and a beloved colleague. The Pancreatic Cancer Action Network can always use your donations. 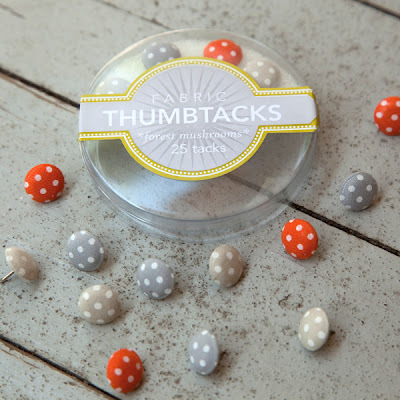 I saw these decorative pushpins at a local open studio event this past weekend, and was reminded it's been long time since I last wrote about such products — so here's an update. Connie doesn't have any of her pushpins listed on her Etsy store right now, but if you wrote to her I'm sure she could arrange something. Connie noted that she's seen people use these to hang necklaces along a wall, and I can see how that would make a nice display. Sweet Virgil's Vintage has lovely pushpins made from sea glass, vintage buttons, and other interesting materials. A number of folks make eye-catching fabric-covered button pushpins; one of them is Susan at Sweeter Lemon. 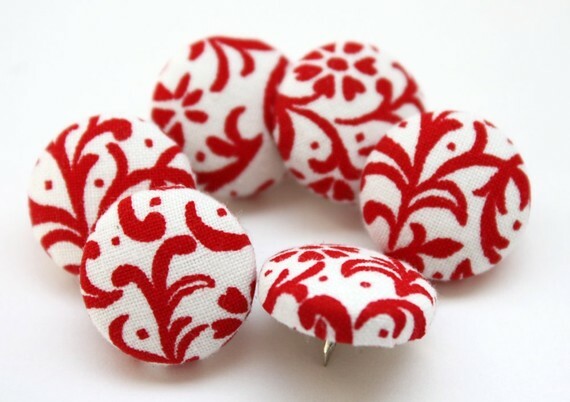 Hollie Lollie sells pushpins in two sizes; these are some of her large pushpins, "embellished with a button covered in pretty designer 100% cotton fabric." 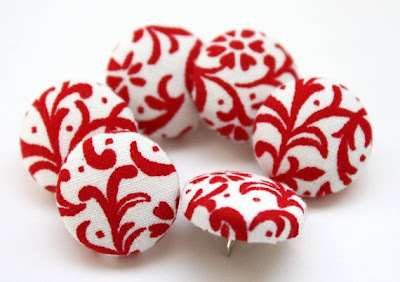 Girl of All Work has four sets of fabric-covered thumbtacks; you can also find some of them at See Jane Work and Paper Source. 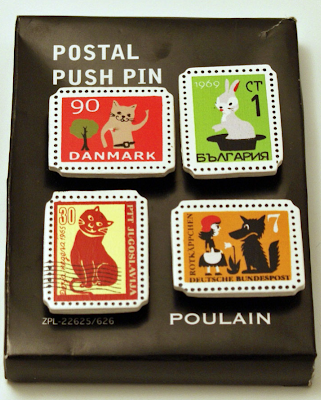 For something totally different, take a look at the postal stamp pushpins sold by Omoi Zakka. And finally, let's note the many novelty pushpins: the swords, the medieval weapons, the teeth and the Phillips-head screws. Many of these can be found at numerous online shops. Want an organizing challenge? 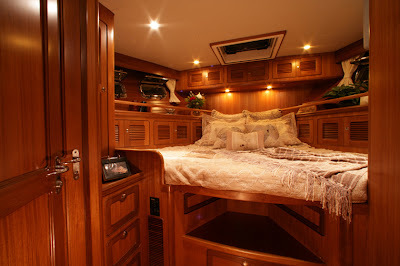 Try living in a converted bus (as I posted about some years ago) — or on a boat! Cruising life changed our perspective on life. We learned to slow down and smell the sea air. We learned how to live in harmony together in a small space, and to value the people around us. Most importantly, we learned not to cram so much into our lives, but to live each day to the fullest. Looking back, I am amazed how much this life aboard has changed me. ... I have reduced my possessions again by half, discarding the things that no longer add value to my life. My wardrobe contains only the things I actually wear. 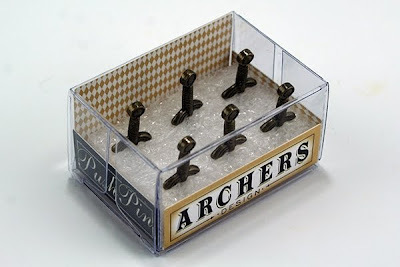 I no longer have a desire, or the space, for the latest gadget, another seldom-used appliance or dust collecting knickknacks. 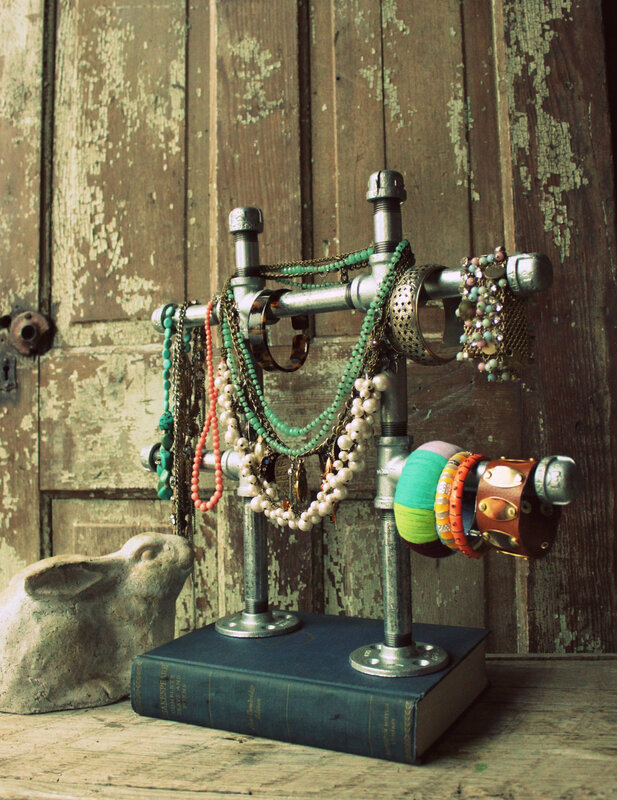 Now you'll find displayed a small collection of items I've picked up in my travels, each one holding special meaning. Typical American consumerism is rapidly becoming a thing of the past for me. There’s an ever-evolving art to living small. Attitude is most important. Humor, tolerance, flexibility, ingenuity… not a bad set for life itself. A friend told us early on, “To live in a small space, you’ve got to be ruthless.” The more you can dis-attach yourself from stuff, the easier it is. Jettison those old high school medals, momentos of this or that, tureens. Cultivate a rich, internal life. Treasure memories, not souvenirs.